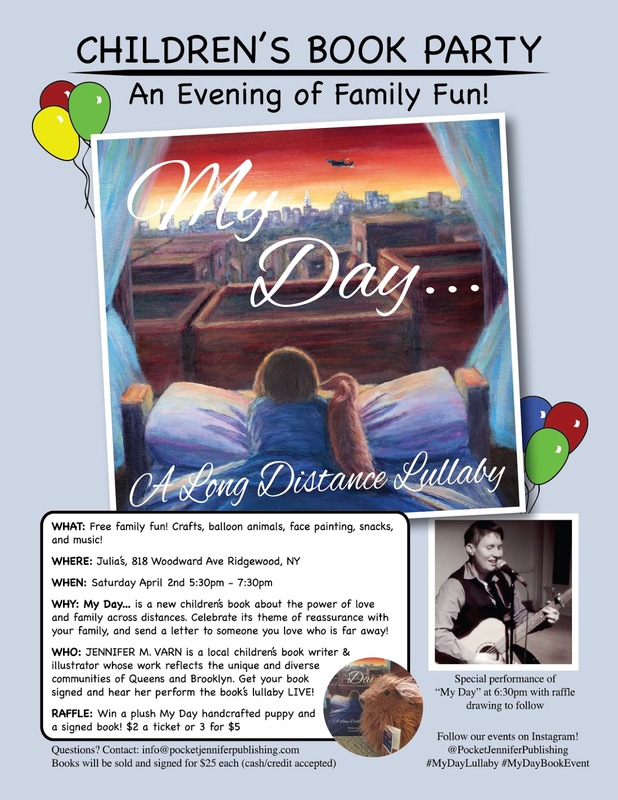 Join us at Julia's in Ridgewood to celebrate the debut picture book My Day... A Long Distance Lullaby, written and illustrated by local Queens artist, Jennifer M. Varn. There will be crafts, balloon animals, face painting, snacks, and music! Event starts at 5:30 pm and ends at 7:30pm. 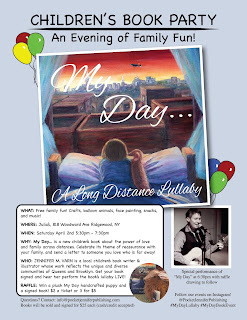 My Day... is a children's book about the power of love and family across distances. Celebrate its theme of reassurance with your family, and send a letter to someone you love who is far away! *There will be a raffle to win a plush My Day handcrafted puppy and a signed book! $2 a ticket or 3 for $5. Books will be sold and signed at this event for $25 each (cash/credit accepted). JENNIFER M. VARN is a local children's book writer and illustrator whose work reflects the unique and diverse communities of Queens and Brooklyn. Get your book signed and hear her perform the book's lullaby LIVE! © 2015 Pocket Jennifer Publishing .